It's a light week for the show. We're off on Sunday, since more or less every magician in the Greater Toronto Area will be at a secret gathering of magicians. To make up for it, we have a special guest joining us at The Bear on Friday. In addition to the regularly scheduled Phil Pivnick, we have Michael Feldman joining us all the way from San Diego. Michael is a brilliant sleight of hand performer and has the perfect dry wit for the British-styled Bear in Pickering. It's a sold out show, so we're looking forward to seeing everyone with ticket. On Thursday, fresh off the birthday rush of turning 30, the ever delightful and charming Ben Train. And if you're looking for something to do on Sunday while we're off, Jason Palter is performing at Yuk-Yuk's in Ajax (details available here). 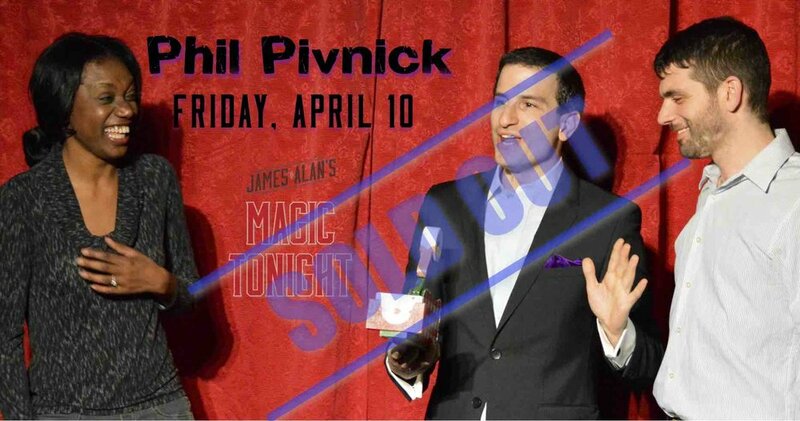 Magic Tonight is performed weekly in Mississauga, Pickering and Toronto. Readers of this blog can use the code reality for a discount on the price of tickets and dinner when purchasing online.